The Brooks Brothers’ holiday gala was held December 8th at the firm’s Manhattan flagship store, 346 Madison Avenue (namesake of the clother’s “346” line of menswear). Chief among the night’s grand unveilings was the Brooks bar, a lounge and pool hall on the fifth floor of the shop. Prince Albert slippers are uniquely situated in the haberdashers’ galaxy for their uncanny ability to do for men what threshers do for farms: that is, separate the wheat from the chaff. Or the boys from the men. In our defense, we’re in good company. Specifically, Bobby Kennedy. And Ralph Lauren. And Dean Martin. And, of course, His Royal Highness Prince Albert, who married Queen Victoria in 1840 and lent his name to the slipper as his wife lent hers to the era. Gentlemen of Victorian England, ever exemplars of propriety, refused to wear their shoes indoors. The behavior likely owed as much to the poor condition of Victorian streets as to manners: shoes (and feet) of the period took a daily beating at the hands of mud-slick cobblestones and street grime. The Prince Albert slipper, above, is loafer-shaped and pulls on; there are no laces. They’re made of velvet and have a raised leather heel, so that they can be worn lightly outdoors. They come either unlined or lined in quilted silk. The more rakish also come embroidered: monograms across the toe are popular, as are coats of arms. 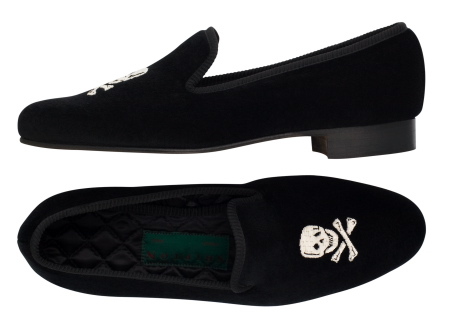 American makers Stubbs & Wootton and Del Toro, both of Florida, offer more whimsical fare: slippers embroidered with martini glasses, skulls-and-crossed-bones, dollar and euro signs, sail boats, and that sort of thing. Del Toro in particular seems intent on cornering J. Crew’s embroidered critter market. Brooks Brothers offers a model in black velvet, with its emblematic “BB” in gold script across the toe, and couturiers Ralph Lauren and Paul Stuart each sell a take on the Prince Albert. And there, the defense rests. Asked to check out Brooks Brothers on its 175th anniversary, I thought it best to outfit myself for the visit from head to foot in their clothing. It was not too difficult, since I have been a patron for years, as was my father before me, and his father before him. I missed out only on the shoes. I have an unnaturally wide foot, a triple E, and their shoe department stops at a single E, shoes that would have caused a wince at every step if I could have squeezed into them. But the rest was all theirs — socks, underwear, tie, a white button-down shirt, and a slightly rumpled seersucker suit, which was appropriate because it was a hot summer day. The blue flag with its legend attesting to “175 Years of American Style” hung listlessly in the heat over Forty-fourth Street. Once inside the pleasant cool of the store, I was taken in hand by Wayne Sheridan, a salesman on the first floor. He has been employed by Brooks Brothers for thirty-five years. That is by no means remarkable. Indeed, the employment record is held by salesman Joseph Mancini, who retired in 1992 after sixty-six years of service. Another salesman, Frederick Webb, worked in the store selling suits up through his eighties. 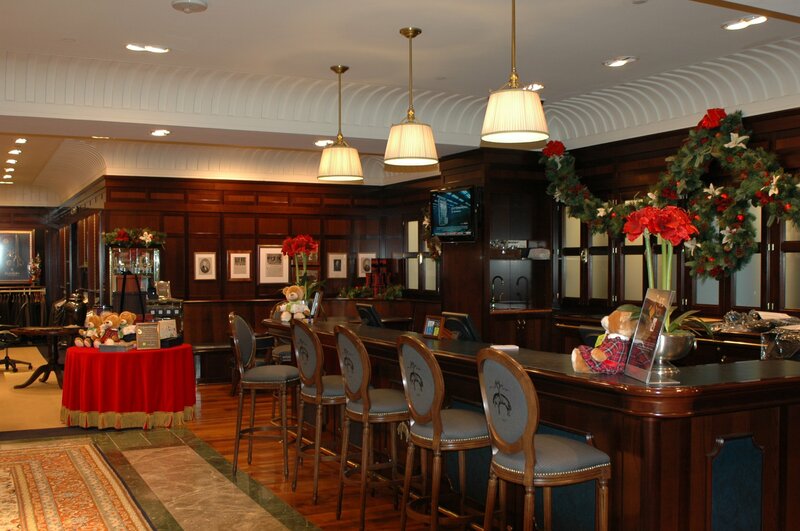 Among his steady customers (”see you” patrons, in the jargon of the store) were members of the Morgan banking family. He served five generations of them during his sixty-five years of service. He could never bring himself to judge when the young Morgans reached an age when it was no longer appropriate for him to call them by their first names: no easy solution. So he simply continued on a first-name basis with Morgan family members throughout their lives. Mr. Sheridan, being on the first floor, which features ties, shirts, and men’s accessories, does not have quite the “see you” patronage situation enjoyed by the suit salesmen on the fourth. But he told me he had once sold a button-down shirt to Joan Collins. He remembers John F. Kennedy in his senatorial days, walking past the tie counter with his hands in his coat pockets. We walked over to his tie counter. I asked how many were sold on a good day, and he said upwards of a thousand. Noticing one with a pattern of seals balancing beach balls on their noses, I commented that I had expected only regimental ties. “Why not Brooks Brothers?” I asked. Mr. Sheridan smiled again and asked if I’d like to take a crack at selling ties. He said he’d try to steer some Japanese patrons to the counter; there were bound to be a lot of them in the store. In fact, he went on to say, these days the Japanese head the list of foreign patrons. They carry their calculators with them, their eyes widen when they figure out what extraordinary bargains are available. The Italians come next. Giovanni Agnelli, the gentleman who runs Fiat, buys at Brooks Brothers frequently. “He buys lots and lots of shirts,” said Mr. Sheridan as he went off looking for some Japanese. They wandered by eventually — a solemn-looking couple. “How about these seals balancing balls on their noses?” I said. “Very popular with the young crowd.” The pair inspected the tie gravely, and then moved on without a word. I remarked to Mr. Sheridan that Ralph Lauren probably had had his bad days, and then I wondered aloud if his innovative design ideas would have been accepted by today’s marketing people. A bit of background. The store was founded — “established” is the proper Brooks Brothers term — on April 7, 1818, by Henry Sands Brooks. A dapper dresser, he often traveled to Europe to supplement his wardrobe. What he brought back, especially his colorful waistcoats, was the envy of his friends. Considering that the bulk of his transatlantic luggage began to consist of materials, coats, waistcoats they had begged him to purchase for them, it was a natural step to go into the business professionally. For $17,000 he bought a frame building with an arcade that stretched over the sidewalks of Catharine and Cherry Streets, on a corner near Franklin Square, then the center of New York’s mercantile district and within blocks of the more fashionable residences of the time. The articles that could be purchased ready-made were folded and laid out in neat row on tables. On pleasant days some of the suits were hung outdoors on hangers, flapping in a breeze like laundry on a line — a primitive precursor of the display window. The store moved five times — each time farther uptown toward its present location on Madison Avenue and Forty-fourth Street and bringing with it traditions that became increasingly hallowed over the years. Throughout its history it catered to a clientele that prided itself on its sense of taste and its fastidiousness. Andrew Mellon, the banker and philanthropist, spent long minutes at the tie counter before selecting what he wanted —always black with small white figures — which he would invariably take outside to see how it looked in the sunlight. So staid was the organization that its credit department would not allow Rudolph Valentino — who fancied Brooks Brothers hats — to open an account at the height of his career. Of course, it was exactly this brand of elitism, carried on through the years, that made Brooks Brothers a world-famous institution, and indeed lured “outsiders” into the store. Given this tradition, one might suppose that the company’s policies have remained rather rigid over the years. Not at all. The store — to the surprise of many — has often been a pioneer in men’s fashion. The famed Golden Fleece has been Brooks Brothers’ trademark since the 1850s. Often jocularly referred to by the saIesmen as a “pig in a sling,” it is in fact a sheep suspended in a ribbon. It was a symbol of British woolen merchants, and before that of the Knights of the Golden Fleece, founded by Philip the Good, Duke of Burgundy. Each knight wore the emblem over his heart; it symbolized the Lamb of God. The logo has become such a familiar status symbol that it apparently has value even when it isn’t attached to anything. There are stories of customers buying the least expensive item in the store bearing the Brooks Brothers logo and then transferring the Fleece to something more substantial — perhaps to a suit of inferior make. “An empty gesture,” a salesman informed me. “That certainly wouldn’t fool us.” He went on to describe a man who nervously asked for an athletic supporter and then turned it down because it did not have the Brooks Brothers label. “So it’s safe to say that the logo itself is responsible for many of the sales,” I suggested. “Do they buy seersucker suits?” I asked. The fourth floor is the sanctum sanctorum where customers are introduced to the Number One Sack Suit. A suit at Brooks Brothers these days costs anywhere from $295 to $895 (the readymades, popularly described as “of-the-rack”) on up to $1,600, the so-called “special order” where the suit is tailor-made to the client’s specifications. Often as many as fifteen new orders are made during the day, and, of course, customers come in to have second and third fittings as well. The fourth floor remains very much as I remember it from my first visits — the cavernous room almost ecclesiastically quiet. I said to a salesman that it looked about the same. He shook his head. “There have been changes,” he said emphatically. I went up to the executive offices on the eighth floor to hear about some of them with William Roberti, who has been in charge of operations at Brooks Brothers since January 1990. We met in his office — a comfortable corner room, complete with fireplace, quite clublike in tone, which in fact does not reflect Mr. Roberti’s background at all. He admits to not being a tried-and-true customer, though to my unpracticed eye he appeared to be wearing a Brooks Brothers suit. I asked, and he was. A powerfully built man, he is a lieutenant colonel in the army reserve, and indeed had just returned from maneuvers. A no-nonsense character. I asked how one went about removing the Ivy League stigma. “Hardly Ivy League territory,” I said. I asked if the Golden Fleece was carried on the eye frames. When I asked about the new products, Mr. Roberti mentioned pigment-dyed washed-twill sports shirts, Brooks blue jeans (”years ago could you imagine that Brooks would one day carry blue jeans?”), and more recently a baseball jacket — what is referred to as the “varsity jacket” — snap buttons down the front and available in burgundy, bottle-green and navy. I asked him what he thought the founding brothers would have made of all this — the varsity jacket, the blue jeans, and the most radical change of all, getting into the wholesale business. Of course, all of this is important. As previously noted here, taking care in appearance is very important because appearances are often first indicators of deeper characteristics. An attorney with untied shoes might write equally sloppy briefs and motions. A doctor with stains on his cuff might be equally lazy about washing his hands before surgery. And so on. The thinking is: industry, care, attention to detail, and cleanliness, if present within, will be reflected without. The same holds true of their absence. As also previously noted here, however, the importance of appearance as an indicator is in hinting at deeper values, not as an indicator of appearance itself. Tying your shoes doesn’t make you a good lawyer any more than wearing boots makes you a cowboy, unfortunately, and clean cuffs won’t make you a good surgeon any more than a magnifying glass makes you a detective. Dressing well is fine, but dressing to purposely evoke an image is worthless without also acting in the values and traditions of that image. Absent the actual identity, you’re only wearing a costume. Men used to wear button-down Brooks collars and repp ties with khakis and Alden loafers because it’s what they’d grown up with, and the clothing was a uniform which was, like all uniforms, incidental to their jobs. And like uniforms, their clothing was habitual. For example: an army officer wears a brown shirt because it’s part of his uniform. He may own 10 identical brown shirts, and take one down to wear every morning without a second thought. A civilian who asks his tailor to make him an expensive brown shirt, and takes it down in the morning and obsesses over the buttons, the epaulets, the creases, the medals, and then wears it very self-consciously because he wants to mimic the army officer style… isn’t an army officer. In Evelyn Waugh’s classic Brideshead Revisited, Charles Ryder’s cousin Jasper gives him some advice on dressing for Oxford. There isn’t much detail… certainly less than can be found daily on the fashion blogs. Commentator Michael Anton explains: “Forty years ago, when a father introduced his tailor to his son, they probably both thought, ‘This is something we do, but let’s not dwell on it, because that would be unseemly’. They’d look at the level of interest on these internet forums as going way beyond what is appropriate.” Clothes are a means (appearance) to an end (respectability), not an end unto themselves. Here, two competing schools of thought emerge. In the first corner is a disdain for costumes and affectation. For those born to a station which includes a certain look, that look comes without effort. Men from certain backgrounds reach for the Sperry brand boat shoes because it’s what they know, not because an internet discussion board said they should. Those who put in effort to look a certain way must not have come by that look naturally. In the second, competing corner: a great sigh of relief that men think it worthwhile again to be aware of proper dress and try their hand at it, even if the effort requires, well, effort. Surely we can’t be any worse off for more men wearing ties and actually caring about how to knot them, and it beats the hell out of more denim shorts and Bluetooth headsets. Bow ties are cool again. Made from such little material, the bow tie can speak volumes, and lately it has. The neck wear, once only the domain of either the staid and stately or the faculty club, is on the rise: bow ties have shown up in concerts, on athletes, and in Gossip Girl. Traditional menswear bastion Brooks Brothers has always carried bow ties, and today continues to sell an assortment. They can be had in patterns like madras, rep stripe, polka dot, plaid, seersucker, and more. Brooks Brothers neckwear manager Richard Cristodero couldn’t be happier: the house’s retail stores around the country report bow ties flying off the shelves, in record numbers weekly. They’re reportedly the only item that is selling better than it did last year. An image of sophistication and security might be behind the re-emergence; in times like these, we like to look smart, assured, and secure. Yet there’s a rake-ish quality to them, something a little less respectable despite its elevated station; the raffish associate, caught with the secretary, maybe. Also experiencing a re-birth: narrow ties, cardigans, and vee-neck sweaters. That is to say, basic East Coast college chic, although “chic” is the opposite of the look. Winston Churchill, and bow tie.